This summer I am going to Bosnia to work as an arts leader for an organisation in an area called Brcko. It is part of the European Voluntary Service (EVS) / ERASMUS+ and the organisations are Svitac, and Firefly International is the partner organisation in the UK. I will get local language lessons there, but at the moment I am trying my hand at some simple phrases. Svitac is a multi-ethnic youth arts organisation in based in Brčko, in the northeast of Bosnia and Herzegovina. Since 1998 they have worked in Brčko applying creative arts and education activities to encourage reconciliation within the community following the devastating mid-1990s Bosnian war that the land has yet to really recover from. "We are doing this all while strengthening local youth’s connection to the rest of the world, supporting them in their personal growth and letting them indulge their creativity. We know from experience that working on shared interests can help strengthen a community as a whole, and overcome perceived boundaries between peoples or with their environment, through positive communication, friendship, education and the arts. We organise a wide variety of workshops throughout the year, focusing on arts and education and also organise summer camps for the children of Brčko every year." Svitac began in Brčko as Firefly Youth Project in 1998 when British-born Ellie Maxwell founded us after the Bosnian conflict (1992-1995) ended. During the conflict, Ellie was an aid worker and through her experiences, came to believe that shared creative activities and contact with the outside world can play an important part in reducing tensions linked to sectarian violence. After the war, the Dayton agreement divided Bosnia into regions separated by ethnicity—the Bosnian Federation and the Serbian Republic. However, the Brčko District was given special status with the UN remaining in control of a multi-ethnic local government. Despite attempts at “ethnic cleansing”, Brčko’s population remained a mix of Bosniaks, Serbs and Croats, a vestige of the old, multicultural Yugoslavia. It was clear that Brčko’s mixed population provided a unique setting for reconciliatory youth work and the founding of Firefly was encouraged by the Organisation for Security and Co-operation in Europe (OSCE) as multi-ethnic youth work was considered an important part of the post-war reconstruction of Bosnian society. The project began with just two international members of staff and was funded by students at Edinburgh University. Within two months, the first Bosnian staff members, Senka Blagojevic and Samir Muller joined. In 1998, the Firefly Youth Project began to run community strengthening creative arts and language workshops, events, and summer camps for the children of Brčko – all of which continue to this day. By 1999 our cultural exchange’s started to take place, with children from Mostar and Brčko taking part in music and drama camps on the Croatian coast, as well as our first Brčko festival (Brčkofest). In the same year the United Nations High Commission for Refugees (UNHCR) asked us to run its two centres in outlying areas of Brčko District. In 2003, the Firefly Youth Project became Svitac (Bosnian for “Firefly,” pronounced “Svee-tatz”) following registration as a local non-governmental organisation (NGO) under management in Brčko with Gordana Varcakovic as Director. Firefly’s operations in the UK simultaneously Firefly International and the two remain one another’s primary partners to this day, with Firefly International supporting our work through fundraising and overseas volunteer recruitment. "Sadly Ellie Maxwell passed away in 2009 at the young age of 32, but her work and vision lives on. In 2010, Firefly International generously supported Svitac to purchase our own permanent space for activities christened “The Ellie Maxwell Youth Centre” in memory of the founder." "Since our establishment more than 15 years ago, Svitac has played an important part in strengthening the community of Brčko from the ground up. This would not have been possible without the hard work of our founders, staff and volunteers and the on-going generosity of our supporters. We continue to evolve, building stronger working relationships with local NGO’s and developing volunteer opportunities with a wide range of international partners. As we grow we hope to create new opportunities for international friendships and wider cross-cultural understanding." 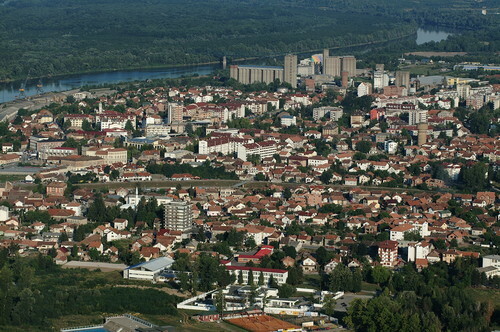 "Brčko is a unique place in Bosnia, which adds to the significance of work of Svitac. To understand why, we must first understand some aspects of the Dayton Agreement that ended the Bosnian war in 1995. Dayton signified the end of the civil war, but divided Bosnia into two separate regions based upon ethnicity: a Bosnian-Croat Federation and the Serbian Republic." "At that time the status of Brčko District could not be settled upon. Finally in 1999, the district was given a special multi-ethnic status. Called the “Brčko District of Bosnia and Herzegovina” it operated on a self-governing basis, distinct from either of the two separate regions and characterised by having a multi-ethnic local government." "At first the United Nations remained in control of Brčko’s government through the Office of the High Representative with an international supervisor who had power over local government, enforcing the Dayton Agreement and making sure political and economic reforms were implemented. As of today, though, Brčko’s District Government is independent of UN supervision." In this map, you can see how the country was divided. The Brčko District is in a slightly darker grey. "Because of this special status, Brčko District is the most ethnically mixed region of Bosnia. Unlike the rest of Bosnia, its school system is integrated and young people of different ethnicities are educated together." Before the war the town of Brčko was home to an estimated 41,000 people, with a plurality of Bosniaks, significant Serb and Croat populations, but many people identifying simply as Yugoslav (no specific ethnicity). Serb army forces seized the town of Brčko early in the war on 7th May 1992. Many men were detained in a concentration camp situated outside the town during the war, while women and children were able to leave to Muslim or Croat controlled areas. A series of mass graves have since been found in the area. At the same time, many Serbs who had been forcibly displaced from areas such as the Krajina or Sarajevo (after Dayton) moved to Brčko. As a result of all this displacement, the town’s current inhabitants are majority Serb, even though many of the inhabitants who left during the war have returned. The population stands again roughly 40,000 today, and the total district population 100,000. Brčko’s outlying districts have different ethnic breakdowns, For example, Rahic is Bosniak, Broduša is largely Bosniak with a Roma minority, and Dizdaruša is almost equally Bosniak and Serb. Although the economic, infrastructure and political situation in Brčko has been slowly improving for years, there is still a long way to go and much work to be done between the different communities before any kind of multi-ethnic society can develop. Bosnia and Herzegovina overall, though, suffers from deep and long-standing post-war economic problems that have been threatening the stability of its peace process. Svitac, along with other organisations in the region aim to counter any trends that can threaten it.